Make your own slow drip irrigation system. 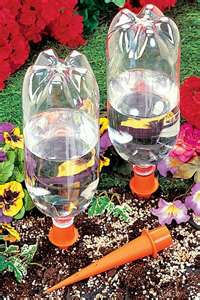 It is a great way to water plants because it directs water right at the roots. I found this information on a community gardening site called yougrowgirl.com several years ago and it does work. 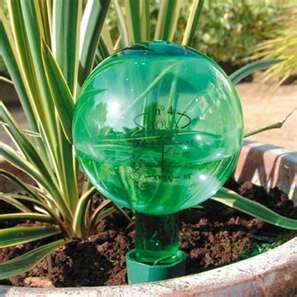 You can use it all the time if you have trouble finding the time or remembering to water your container gardens daily. It’s also good to use on a temporary basis if you are going to be away from home for a few days and don’t want your plants to wilt or die while you are away. One of the best ways to provide a steady water supply to your plants without your constant attention is a gradual watering system or slow drip irrigation. A device is filled with water and it slowly delivers water into the soil directly around the roots. You can purchase a commercial system or watering spikes, but you can make this one at no cost. 2 empty 2-liter soda or water bottles – choose the size of bottle for the container you have. The bottles will need their lids. Drill several small holes into the cap of the plastic bottle – I put 6 in mine. If you want it to drip slower use less holes – faster requires more holes. Make the holes big enough that little pieces of soil, peat, etc wont clog them up. Use your knife to remove the very bottom of the bottle. I use a serrated knife which works well and I also have some old, all purpose shears that will cut through the plastic once I get it started. Just cut the very bottom of the bottle so you will have as much of the container left as possible. The wide opening will make it easy for you to fill with water and it can catch rain water too. Dig a hole behind a plant or in between a couple of plants in your container garden – it needs to be deep enough to bury about 1/3 of the bottle in the soil. You can hide it behind plants or flowers if you want to leave it there all the time – if you’re just using it temporarily, it won’t matter. Place the bottle in the hole with the cap side down and secure it with soil to keep it in place. Fill the bottle with water until if is full. You can also add some water soluble fertilizer to the water if you’d like. The fertilizer is going to go straight to the roots which is great. Fill the bottle when empty – depending on heat, wind, etc. And now, you have an easy, no-cost slow drip irrigation system!